This month one of my teachers and friends Sarah Furey has submitted a guest post for our blog party on herbal hugs. Being an old Druid at heart, one of Sarah’s favourite herbs is Vervain and here she shares some of the reasons why she loves it. Pop back tomorrow to read my post for the Herbal Hugs Blog Party and on Thursday when I’ll share links to the posts of everyone who’s entered. My herbal hugs would have to include Vervain (Verbena officinalis), the sacred herb of the Druids who treated it with such reverence that only the chief Druid was allowed to take it from Mother Earth. I first came across this plant when I was looking for herbs to help patients cope with the stresses of modern day living. It is now my favourite herb for people who have overactive minds and who can’t relax when it combines well with Borage for the adrenals. It is excellent for anxiety states and tension headaches. As a nerve restorative it works really well alongside Avena. It is a powerful liver herb so works well for people who have trapped emotions – frustration or un-expressed anger. Sadly it is not easy to find in the wild these days, though I did find some two years ago near Chanctonbury on the side of the Downs. Of all places, I also found it at the top of a mountain village in Northern Spain this September. I think the walking group thought I was crazy I was so ecstatic! Now I grow it in my garden and have made a tincture for the past two years from the delicate flowering tops. The colour was tinged with a purple hue and for me, that adds to its magic. Dried, it makes an excellent bedtime tea (as one who’s mind is often over-active!). The flower essence I have made is for connecting to the Spirit World – of course. The photo is actually of my vervain, just plain Verbena officinalis as far as I know, It is quite pale in reality but with a definite lilac hue. I’ll make sure I point Sarah in the direction of your comment though re the tincture. I really can use the advice of vervain tea before bed time! So lucky I just happen to have it here in New Zealand for the first time. In Austria it is still growing like crazy along ways in the fields. As far as I remember it is much smaller and deeper purple as the ones I grow now here in NZ. Great! let me know whar colour it tunrs out! Forgot to mention that I know vervain was used to cleanse the altar, but I didn’t know that only the chief Druid was allowed to harvest vervain. Can you recommend a book(s) to learn more about the Druid’s sacred herbs? There are a couple of good books- My favourite is Brighids Healing by Gina McGarry about Irelands Celtic medicine traditions. Angela Paine’s ‘the healing power opf Celtic Plants’ is another good one and Ellen Evert Hopman hasd produced a ‘Druids Herbal for the Sacred Earth’. Lucoinda had just given me her Druids Herbal of Sacred Tree Medicine…cant put it down Lucinda! Hi Sarah, many thanks for the interesting post. I first came across vervain via Non Shaw and Chris Hedley – I couldn’t quite get my head around how a herb could make you let go, but of course it does! 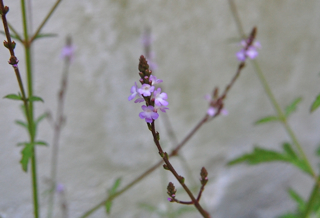 I use vervain in so many tonics to nourish the adrenal glands while coping with life’s challenges. This year I made a flower only tincture, in the hope it would have the same properties as a flower essence. Haven’t tried it yet! I did put vervain in with one of my tea blends a couple of years ago, but wouldn’t recommend it. Its bitter quality really does cause the drinker to physically shudder, which can be a little offputting! My two major vervain plants died two years ago, so I’m trying to build my stock up again. It’s a herb I cannot do without.